And of our fellow man. In the face of this electoral season's acrimony, it behooves us all as Americans to every now and then declare a truce, step back from the brink and to take stock of this awesome Nation of ours. Be you Raving Liberal or Vast Right-Wing Conspirator, this time is not about you. Or about me. It is for The Fallen. Each year the soldiers of the Third United States Infantry Regiment ("The Old Guard") take part in the ceremony called "Flags In." Just before Memorial Day, each grave in Arlington National Cemetery is decorated with a small American flag. The flags remain in place until the conclusion of the Memorial Day Weekend when they are all removed. It is the only time during the year when American flags are permitted at all gravesites in the Cemetery. The "Flags In" detail took place this year on Thursday, 27 May 2004. Personally, I believe deeply that we lose something vital to our survival as a Nation when we forget the blood of patriots. Words, symbols, heated rhetoric and clever argument all pale when measured against the brilliance of the white of marble, the emerald carpet of living grass borne over they who rest beneath, forevermore. 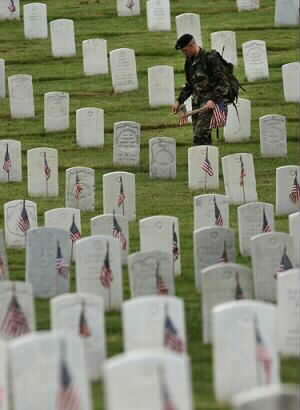 And the fields and fields of flags upon each, bearing quiet witness to the precious, eternal value of that sacrafice. 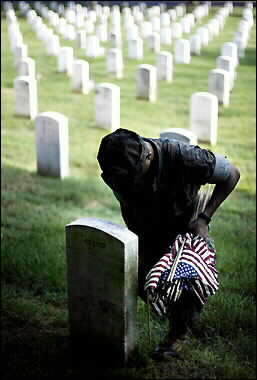 Dignity, honor, respect and a day of rememberence is all that they ask now of us. So, this weekend, set aside if only for a day, thoughts of (D) or (R). Rail not against your fellow American, nor wish harm to him, his party or his creed. The men and women in those graves are no longer Democrats or Republicans. They are still and eternally though Americans, and are forevermore worthy of this day given but to them. Honor the Day. Honor Them. From their dark and silent graves, they give more honor to our Nation than any one politican, party or officeholder dares ever imagine. Dignified beyond words, with nobility above the highest offices of government, these silent warriors speak loudly of what it is to be American. They did not die for the Republicans. Nor for the Democrats, Greens or Libertarians. Whether in combat, or fifty years later surrounded by only the memories of comrades long since passed, the men and women resting forever under those flags once marched proudly under that banner. They have earned nothing less than the unqualified respect of a grateful Nation, and her grateful people. The last full measure of devotion is an awesome, terrible thing. Yet, magnificent; and it is upon the altar of their sacrafice that we enjoy the freedom of the greatest Nation in the history of the world. Stand and salute, and remember them. For our own sakes, and especially for theirs. A true reality check, and reminder of just what is really important in these troubled times. I watched the live telecast of the WWII Memorial dedication today. It was touching and wonderful; however, your blog was more inspiring and beautiful. Again, thanks for sharing your matchless way of helping us BE Americans. Fantastic post, Jim! Thank you, on behalf of my fellow vets and myself, for pointing out the sacrifices that were made. One day a year to be remembered is not that much to ask. Thank you for bringing that up prior to a day which many now just think of as the unofficial first day of summer. Several years ago I traveled to Berne, Indiana on a genealogy project to photograph ancestor gravesites. What a thrill it was to see all the flags on the graves of every man who had served, from Revolutionary War on to the present time. This was in late June, I do not know when they were placed there or how long they stayed, I only know it brought tears to my eyes to see that someone was honoring their service. Ok, trying to get over the goose-bumps you gave me after reading those words. I shall remember them with tears (though I knew them not) and with my children. For my children too need to know why mom has tears in her eyes when Taps are played. My children need to know the price that was paid for our freedom. It wasn't free. One can only lead by example, and I hope that I am teaching my children well when I bring them to events such as this. Each year the Boy Scouts here in San Diego gather as the pre dawn sea layer envelopes Fort Rosecrans National Cemetary. The task is to place flags on each grave. After a brief welcoming, the Scouts are free to roam the grounds and address each grave. The turnout is emormous and the event is humbling. The best part is after the task is done, looking out upon the sight of the grounds covered in flags all snapping a lasting salute in the morning sea breeze... what a great way to start the Memorial Day weekend! I recently spent a week in DC and visited, all too briefly, the monuments. (The new one was not yet open.) It was a very moving experience. I especially appreciated it as I have been overseas now for too long and have taken better measure, living here in Europe, of the importance of Freedom. If only Americans were taught at school how exceptional their country is! What an incredible group of visionaries our Founding Fathers were! Yes, we must be grateful to all the brave souls that were and are our soldiers. Without them, that vision would not have endured. And we must not let them down. Living here in the Washington area I have at times been able to go by Arlington on Memorial Day weekend. symbols of our government and nation, and also of the freedom and prosperity that bubbles around us - peaceful homes, traffic, ball games, church steeples - the unrestricted activities of a free people. Then a slight turn of the head lets you glimpse a rolling sea of flag bedecked headstones that make you realize these were the artists of freedom who painted that picture. If only more people thought like that. I pray we never forget the service and sacrifice those in out armed forces have given us to secure the freedom and hope that we have in this great country.